An ideal way to begin a new year and shake off the cobwebs with a walk around the city of Southampton. If walls could talk they would tell stories of stories of trade, raids and pilgrimage ! Luckily we have our friendly and informed guides to share stores and history about one of the best preserved medieval walls in England. 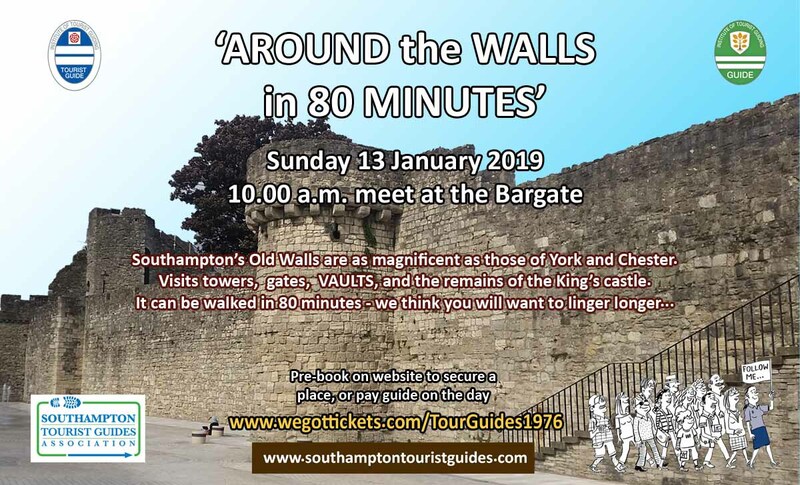 Southampton’s Old Town Walls are as magnificent of those of York and Chester, this walk follows the line of the walls visiting towers, gates, vaults and the castle of the King of England. This is a story of both England and France, a time of war when Southampton was on the front line, and the time when Southampton was starting to look back over its own history to its foundation by the legendary Sir Bevis. It can be walked in 80 minutes, we think you will want to linger longer.